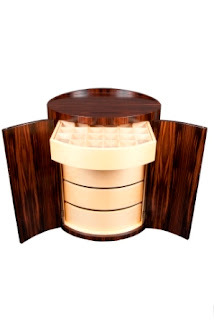 Every so often I'll receive an inquiry to make a hand crafted jewelry box. Usually this is intended as a gift for a special occasion such as a birthday, wedding anniversary, or Valentine's Day. 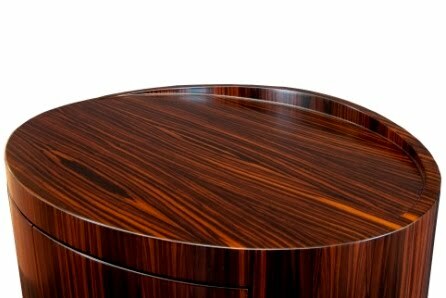 Invariably the lead time is less than a few weeks time, which means that it becomes near impossible to hand craft something exquisite in time to meet a deadline. That being said, I usually have to turn down these commissions due to the impossibly of doing high quality work in a short timeframe. 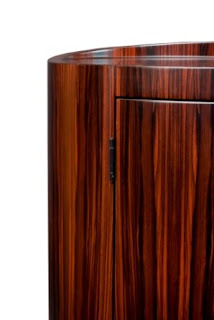 To remedy this I decided to build a custom jewelry chest on spec, so that I could have something readily available the next time an inquiry like this comes along. 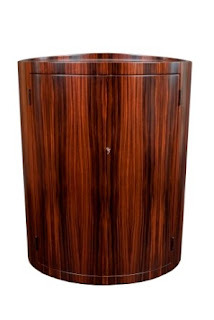 The Ovale Jewelry Chest shown here measures 24-3/16" wide x 18-3/8" deep x 30-7/8" high. 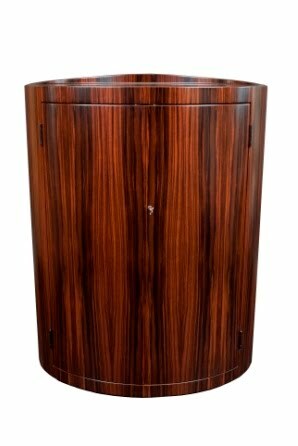 Crafted from a rare sampling of Macassar Ebony the exterior shell of this cabinet has been vacuum formed into a elliptical oval shape. 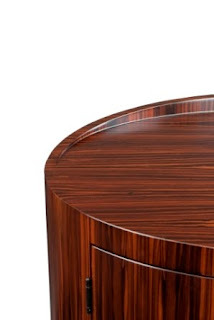 The top has been seamlessly fitted to the contour of the oval shell, with the sculpted back apron cascading gracefully until it disappears into the horizontal plane. 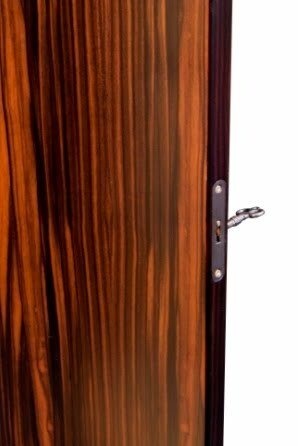 Note how the grain pattern of the doors aligns perfectly with the grain of the top apron. 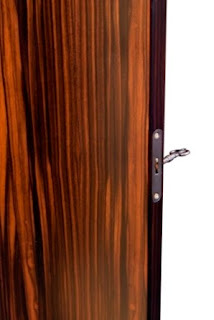 The doors on the front of the chest are secured with ball catches and a fully mortised privacy lock. 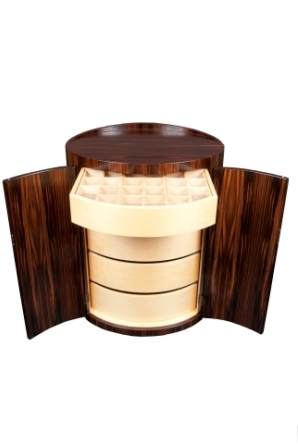 Five generous drawers are located inside the chest, with each gliding effortlessly on concealed ball bearing slides. 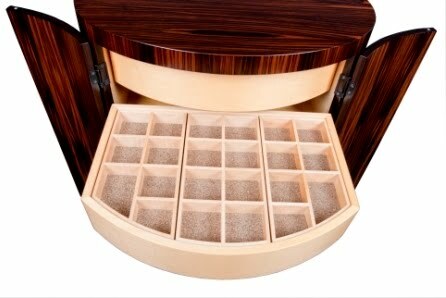 The two top drawers are each fitted with two layers of removable trays. 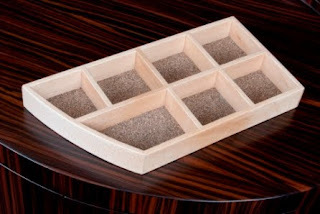 Each tray has compartments for organizing miscellaneous items of jewelry. 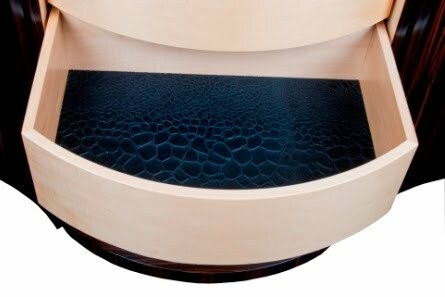 The bottom of each drawer is lined with alligator embossed black leather, which was specially made by Spinneybeck. The removable trays have been hand crafted from solid maple, and are felt lined on the underside. Provision has been made for an engraved plate to be inlaid on the inside of the chest, which can be personalized with a special message.